"Look, Mom! My eyes are growing up!" "I am three. I am three. There is so much threeness..."
Do you not just wish to pinch this poppet? And pluck it? And eat it? On a roll? With mustard? These are rhetorical questions. Who wouldn't like to devour a delicious Crabtot-cutlet! A friend of mine thought to ask me what imitation crab is made of. I of all people should know this. But I don't. And while I could go and look it up, I feel I'd really rather not. It's more fun to see its ingredients in my mind's eye, a whiteness comprised of equal parts rubber cement and whitefish with a veneer of red real-crab stripy meatstrings applied, and a dash of authentic crab juice spritzed sparingly thereon. It is then molded into a plastic claw shape. And when it has set, false crabjuice is liberally smeared over all. That's my version of imitation crab. Anyone actually know what this stuff is made of, though? This is a key question for our times, and it must be answered. I have a blogload of new readers, who I am pretending to ignore and just...you know...do my thing the way I always do, with sauciness and effortless suchlike, but really I am hopping glad that Jezebel and Babble and all that massive Crabmommy-pimping out there is netting me such huge new numbers of hits. Do peruse, new friends, peruse. I may have been indulgent this September, nattering on about Dollar stores and holding competitions for lip balm and such, but really there is real authentic crabmeat in this here blog. Like, just as a random example, here, and here. Mommy-musings of a dark nature. Ruminations on my rural abode and my citygirl's sense of displacement. And of course, shockingly excellent advice about all things tot-rearing-related. And then, it must be said, there is also the meanness. Indeed the crabbing here is loud and abundant. All this and monthly contest in which you can win prizes from my Dollar store! Crabmommy: It's just plain old one-stop shopping, innit? 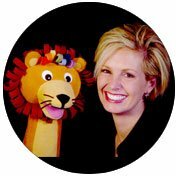 The delightful Redsy, also known as Crankmama (and hence a mom after my own crabby heart) saw fit to drive up my traffic today by showcasing my tampon wiener at Babble, a site I once trashed for its fetching hipster CEOs on video, and before which I now grovel. Watch those Crabhit numbers soar. Yay! This is Crabtot's last night of being two. Not posting tomorrow but see my "birthday newsletter" at the Cookiemag bloglet. It's not what you think. How to Make a Tampon Wiener...At Last! As you know, Crabmommy adores a cheap craft activity with Crabtot. Well, actually Crabmommy just adores cheapness in general, for she is the Cheapmommy! As you may also know, Crabmommy was once inspired to make the tampon wiener you see in the icon on the right. You see, Crabtot's Gammy has a white wiener dog named Gertie, so we decided to pay homage to Gertie with, what else?...a tampon! 1. 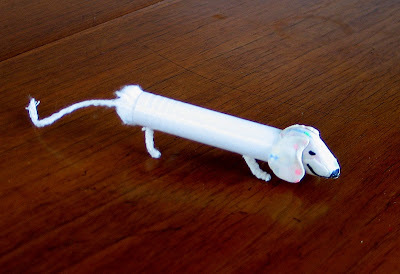 Select a tampon, open it up and pull string to make the wiener body and tail. 2.Model a white playdoh head into a pointy doglike shape and insert cranium-side into tampon tube. 3. Pinch off bits of play-doh and work into shell-like ear-shapes. I must admit, I'm quite good at this. Mold clay onto cranium for dog ears. If this isn't going well, use a matchstick or toddler fork to smooth the ears onto the head firmly. 4. Poke 4 holes in wiener-body undercarriage, wide apart but symmetrical in the manner of sausage-dog legs. 5. Cut matchsticks/pipe cleaner in even lengths (not too long—these dachshunds have short legs, remember!) and insert into the holes. You may have to wiggle to get the angle right for standing. 6. When play-doh is dry, draw eyes and mouth with Sharpie. *Note: Decorating your dog: you can also add dots or other assorted colorations to the tamp-tube as you see fit. If realism isn't your bag, sequins would be an interesting addition if you are going with a sort of drag-queen glam-dog motif. If you're going to get fancy on the decorating, do it before doing head or legs —right after Step 1, to ensure that tot's chubby fingers don't knock head or legs off in the decorating process. If tampon wieners whet your appetite for tampon art in general, you can certainly progress to other tamp-art. I can easily see a sheep...a poodle...some fetching Xmas decorations (especially when dunked in water containing red or green food coloring, and then dried and sprinkled with glitter). Tampons make excellent resources for crafty moms. Enjoy! And please do report back when you try it. p.s. a pic of the Dollar store mystery prize (won by Char) is to come. And please stay tuned for more Mommy-related musings of a crabby nature. Meantime, Monday at the bloglet, musings on how I am a Mommy by day but after dark, I become The Night Momster. Also on Wednesday the 26th, please check the bloglet for a sentimental, gushy birthday newsletter to Crabtot...not. This one is going to be controversial, folks. Whooooooooooooooooooo! No, this is not Crabmommy visiting her Crabcorner neighbor in his summer sleep-shack across the street. 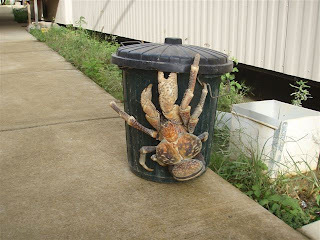 It's called a Coconut Crab. Eeeeeeeeeeeeeeeeeeeeeeeeeeeeeeeeeeeeeeeeeeeeeeeeeeeeeeeeeeeeeeeeeeeeeeeeeeeeee!!! Lassies, please email me your snail mail addresses, to crabmommyatgmaildotcom (I'm not spelling it out so as to confuse the spam robots), and ye shall receive your booty! There were many fine entries. Competition was tough. Thank you for sending me your descrips of dollar store wedding veils, white crocs, saucy spike-heeled neon cocktail stirrers, diamante wedding rings. But some of these were a little too close to my own taste to be true contenders for the prize. Plus, Char sent me a jpeg and friends, that just cinched it. The runner up is Amy, who wrote about her DS carrying a laxative called IPLODE. The name, together with the fact that IPLODE is carried at a DS (I mean WHO would entrust their bowels to a DS?) renders IPLODE deserving of honorable mention. Amy, the runner-up's prize is the fact that you DO NOT have to receive a DS prize in the mail from me. Yay! Well done! Char, if you send me your snail mail you will receive a most fabulous prize that I purchased yesterday. It is a beautiful sculpture of a flower holding a sign. The sign looks like it says "H2O" but one can't be sure because the paint job is off. The sculpture is shaped like some sort of modified piggy bank, but there is no slot. In short, it is a hideous and useless and confusing sculpture...which equals a true Crabmommy Dollar Store Find. Char, you also get a second prize. Because you have to receive this treasure (and hopefully display it on your mantelpiece!) you were also not-so-randomly selected by the Coconut Crab's ample pincer to win lip balm too. He thought it fair, under the circumstances. Plus, we didn't think you'd send us your address otherwise. Well done to all who entered! A rip-roaring success all around, because YOU are silly people and I ADORE you for it! By "shag" I mean shag haircut, you dirty-minded people. I have, at long last, found a good and still cheap hairstylist. This is a big deal in a town where everyone wants to give you a haircut I used to call The Mormon Flip, back when I thought making fun of Mormons was cool, but I don't anymore. (And I have thrown out ALL my John Krakauer books, okay?) Right. So, the cut that I used to call The Mormon Flip. A very sort of Idaho/Wyoming/Utah look (Think of these states as a sort of Mormon Bible Belt... perhaps better known as the Belt Buckle of the Angel Moroni) OKAY, STOP IT, CRABMOMMY. Back to The Look. I have been forced into this look since moving here because that is just the default hairstyle whenever you ask for something funky/ chunky/punky/ layered/interesting. I hate having volume or body of any kind off my head-crown. But boy did I ever receive body when I came here. That, along with dreadful face-framing soft swishy layered bits circa That-Jennifer-Aniston-hairstyle era. And then there was a little pert flip-uppy-thingy at the bottom. Now, how is a pert flip-up punky? you might well ask. I do not know. I do know that I sported this style. And I hated myself for it. That is in the past!!! Finally a good haircut! It happened here, today, and on this head! I have found a guy who does it right, people! No more Pert Mommy Hairstyles for me. I told him no cute, no chic, no elegant. I told him to make me look like a Japanese cartoon character and by golly, he did! Two thumbs up for my new, flat, shagged, jagged little head. Speaking of schwagilicious, I have in fact my very own schwaggy contests happening right here on Crabmommy, as you well know. But tomorrow is the last possible day that you can enter either of the September contests, those being the Dollar store contest and the lip balm sweeps! Put your name down. Winners will be selected on Wednesday, so get your act together if you haven't already, honestly, what are you people doing with your time? FREE STUFF: A Schwagilicious September Giveaway and...Silly Science! Friends, I'm disappointed to see how few of you want to win my Dollar store prize. But that contest remains open, so I remain hopeful. But really, are you guys too good for the Dollar store or what? Only want fancy prizes, do ya? Well, FINE THEN! I have real goodies to give away this September. People, the beauty-booty peeps are coming, waving their tubes of lip balm at the Crabmommy and I say, yes please! And now 9 of you lucky readers will get the chance to win a super-schmantzy lip balm from Aussie company Become Beauty, which will arrive in your mailbox inside a fetching silver tote, containing also sachets of face cream as well as a tiny koala bear clasping a boomerang, which you can give to your tot. I can certainly vouch for the lipsmackibility of my lips after using that balm. In truth, this sort of beauty product line is out of my price range, given that I live in a prefabricated house and have attended birthday parties in trailers. But some of you are in different circumstances and I am trying not to resent you for your swankiness, you spoiled little tarts. Back to the balm! It has jojoba in it and it's also nicely minty and sort of Kiehls-y in its texture, smoothing out those crustacean lips. Crabmommy's are especially unplump because I am allergic to water and live at high-altitude, so I'm basically a round-the-clock raisin. This lip treatment also promises to reduce the appearance of fine lip lines, so if you smoke too many cigarettes, do too much meth, pout too much, gossip too much, or are just plum getting old, then by all means comment, and I will draw 9 winning entries within 5 days. Winners will then email me at crabmommyatgmaildotcom with your postal addresses and that's how we'll do it. Right then! Put your moniker in the hat. Five days and then we draw the winners! This Babble video is actually quite funny. Plug on through the first few seconds and hear this couple's story. Sort of beats mine and Crabhub's—we met on the subway. That's a different post. I'm saving it for a money essay actually (you know, when the magazines pay for that How Did You Meet? piece.) Right. So back to these 2...the mom is hilarious...at one point she recalls a PowerPoint presentation her husband gave her on how to divide the parental duties. They seem perfect candidates for The MartyrMeter. What the heck is up with you people who have not yet told me about a single find in your local Dollar store? People, you can't win the Crabmommy Dollar Store Giveaway if you don't enter. It's been almost five days. What were you doing all weekend that you couldn't loiter in the Dollar store looking for crucifixion puzzles or lawn ornaments made out of chopsticks? I cannot ever get over my love for the Dollar store. It's almost equal to my fear of the Dollar store. And both emotions hit me fresh, whenever I enter a Dollar store. For many years have I loved the various Dollar Stores I have known. That one in Brooklyn where I purchased a rip-off Winnie the Bear tote that said "Vinnie Bear" on it (remember, A.N.? How we laughed!). And now there is the Dollar store down yonder Crabtown street where, when I get over the heady scent of toxic off-gassing and ancient dollar-a-dozen Glade Toilet Freshener Plug-Ins, I find treasures that simply cannot be beat. 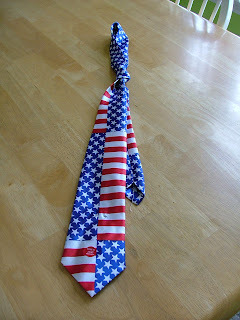 South Africans among you: the Dollar store is a uniquely American thing. A whole huge shop where everything in it costs a dollar or less. Most of it comes from China. And therefore you have to worry whether the chewing gum you just bought got painted with lead leftover from a batch of Thomas the Train toys. So we tend to skip the food. Instead, head straight to the flipflops, which of course, are always right next to the non-magnetic fridge magnets. *a packet of stickers representing the crucifixion. Now I'm sorry to reference the Lord again and all that and please don't be mad, Christians, but HONESTLY, isn't it a bit sacrilegious somehow to put Jesus on the cross and THEN ONTO A STICKER? Somehow I can't see a kid doing this right: peeling off the cross and then ...what? Sticking it at a jaunty angle in a coloring book? This sticker-Jesus stuff is just asking for trouble if you ask me. And if you can't find a Dollar store near you, or fail to spot something suitably absurd in your DS, then just make it up. The winner will receive...a mystery prize from, you guessed it, the Crabtown Dollar Store. Can't wait to read all of your discoveries. Now get out there and shop your collective sock off! As if it's not fabulous enough to have visited a city where you could roll around in a giant vat of fresh-grown broccoli rabe and pay like, twelve cents for it, we had a super-swell time appreciating the proliferation of eco-conscious culture in the city generally. All their new buildings are green-tastic, then there is that public transportation... basically PDX is just so organic and delicious it almost makes you feel a little too healthy and good. Great then, to be back in Wyoming, where, on getting our car washed in one of those infernal towns between Salt Lake and here (I think it was the town called DeBarge, like the 80s group) , our poor vehicle was sprayed with, I'm not joking, a cherry-flavored wash that was bright pink and then leaked a sort of frightening green foam down the windows and then the scent changed to a potent mix of green apple and bubblegum. Crabtot was never so happy as experiencing this car wash. But I warn you, people, unless you have a strong nose, don't get the Super-Premium $10 car wash in De Barge. Because it will Teflon-coat your car in gum. Get the $5 Regular Super wash. Got it? ...Crabfam getting out and getting gritty." So the song goes, though there was nothing gritty about our recent city foray to Portland Oregon, land of Nothing Gritty and Everything Really Damn Nice. What a delight of a weekend. Portland is so cute I could just squish it up on a roll and eat it! It's so compact! It has such sweet little Craftsman bungalows! It's really a sort of backdoor SanFran, what with its excellent produce and craft markets sporting lesbian-made purple-glass windchimes. How scrumptious its oysters and parks! How divine its Asian jardins! How incredibly pleasant its abundant homeless people! Seriously, I have never met such nice and sophisticated homeless people. They are shockingly pleasant. In fact a lot of PDXers seem almost threateningly pleasant: strangers are just so helpful there it's almost sinister. And I am not just referring to homeless ones who probably are definitely actually wanting something from you when they chime in about breakfast spots in their threateningly chipper way...I am talking just generally about genial people on the splendid PDX public transportation, everyone desperate to help you discover a town whose inhabitants could not be more content. As for Crabtot, what could be better than a place where they have this city fountain that kids actually swim in. Jamison Square. It's honestly the best bloody thing I have ever seen. A tasteful stone slab arrangement with water gushing out into a pool where all the kids leap about while parents watch from the lawns, eating their organic pizza from Hot Lips. Excellent! Now that's a fountain you can get into! As opposed, say, to the Trevi fountain in Rome where on a boiling day you—along with a giant clot of Nikon-toting tourists— have to stare at the cool blue delights of water falling on white marble, but you can't climb in. But Portland is far more civilized. It is a city where a Crabtot can feel free to frolic naked upon civic water features. It was also smashing to see smashing friends such as Scott and Jege. We had, overall, a jolly good time. And as you know that always makes me panic regarding blogging. If I am happy and things go well, I have nothing to write about. And that makes me nervous. So I shall leave the Crab-outing there and instead give you the heads-up on some significant Crabmommy happenings to watch out for. Tomorrow, stop by and read about my next giveaway, involving my local Dollar store. Note too: there will be some magnificent schwag happening sometime later this month, here on this very blog. People, the schwag-hander-outers are swarming near me, publicists flinging freebies my way. Stick around. Also please go to Cookie to see my latest invention if you haven't already: The MartyrMeter is a must-have for any new family and makes for a perfect baby shower present. Yay!